Pulling off an impossible task, the authorities in a major city in southern Japan repaired a massive sinkhole that appeared on a main street of the city in just 48 hours. 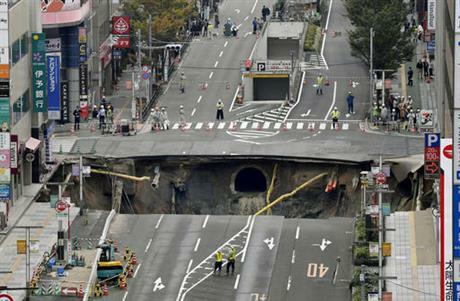 Fukuoka displayed a rare sight last week after parts of a main street collapsed to create a giant sinkhole. Making up for a rare sight, a 30-meter (98 ft) gaping hole was created on November 8 when excavation on an underground train tunnel in the center of the city caused the roadway to fall, which led to cutting off power, water and gas supplies to parts of the city. Authorities said no injuries were reported from the pre-sunrise collapse, which created a sinkhole more than half the size of an Olympic pool in the middle of the business district. However, soon the repair work was kicked off and the roadway was made to function again in about 48 hours time. A smaller sinkhole occurred in Fukuoka in 2014 at another location of the subway construction. Fukuoka, a city of more than 1.5 million people, is about 1,000 kilometers (620 miles) southwest of Tokyo. The massive cave-in appeared in the city's bustling Hakata district, a major business and entertainment center, with muddy underground water flowing into the hole. "An accident like this is unheard of, one that should not have happened," Fukuoka Mayor Soichiro Takashima said. "We must prevent secondary accidents, and will do our utmost to restore important infrastructure."